If your worksheet has a lot of columns, you can use the Scale to fit options to reduce the size of the worksheet to better fit the printed page. Click the Page Layout tab on the ribbon. In the Scale to Fit group, in the Width box, select 1 page, and in the Height box, select Automatic. Columns will now appear on one page, but the rows may extend to more than one page. To print your worksheet on just one page, in the Height box, select 1 page. That said, if you do this however, the resulting printout may be hard to read, because Excel shrinks the data to fit. To see how much scaling is used, look at the number in the Scale box. If it's a low number, you many need to make other adjustments before you print. For example, you may need to change the page orientation from portrait to landscape or target a larger paper size. To print your worksheet, press CTRL + P (CMD + P on a Mac) to open the Print dialog box, and then click OK. If your worksheet as a lot of columns, you may need to switch the page orientation from portrait to landscape. To do this, go to Page Layout > Page Setup > Orientation, and click Landscape. Consider using a larger paper size to accommodate a lot printed columns. To switch the default paper size, go to Paper Layout > Page Setup > Size, and then choose the size you want. Use the Print Area command (Page Setup group) to exclude any columns or rows that don't need to be printed. For example, if you want to print columns A through F, but not columns G through Z, set the print are to include only columns A through F.
You can shrink or enlarge a worksheet for a better fit on printed pages. To do that, in Page Setup, click the Dialog Box Launcher. Then, under Scaling, click Adjust to , and then enter the percentage of the normal size that you want to use. Note: to reduce a worksheet to fit the printed pages, enter a percentage that is smaller than 100%. To englarge a worksheet to fit the printed pages, enter a percentage greater than 100%. Page Layout view isn't' compatible with the Freeze Panes command. If you don't want to unfreeze the rows or columns in your worksheet, you can skip Page Layout view and instead use the Fit to options on the Page tab in the Page Setup dialog box. To do that, go to Page Layout tab, and int he Page Setup group, click the Dialog Box Launcher at the bottom-right side. Alternatively, press ALT+P, S, P.
To print a worksheet on a specific number or pages, in Page Setup, click the Dialog Box Launcher. Then, under Scaling, in both of the Fit to boxes, enter the number of pages (wide and tall) on which you want to print the worksheet data. Note: Excel ignores manual page breaks when you use the Fit to option. Excel also does not stretch the data to fill the pages. To Remove a scaling option, go to File > Print > Settings > No Scaling. When you print an Excel worksheet, if the printed font size is not what you expected, you can scale the worksheet for print by increasing or decreasing its font size. In the worksheet, click File > Print. Under Settings, click Custom Scaling > Custom Scaling Options. Click Page and in the Adjust to box, pick a percentage by which you want to increase or decrease the font size. Review your changes in Print Preview and if you want a different font size, repeat the steps. Note: Before you click Print, check the paper size setting in the printer properties, and also make sure the printer actually has paper of that size. 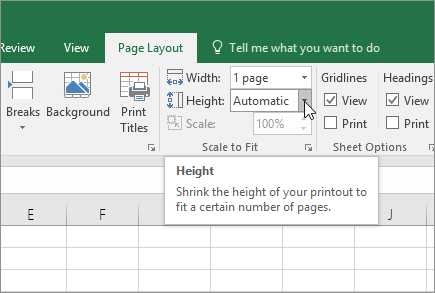 If the paper size setting is different from the paper size in your printer, Excel adjusts the printout to fit the paper size in the printer and the printed worksheet might not match your Print Preview. In Print Preview, if the worksheet appears compacted to a single page, check if a scaling option like Fit Sheet on One Page is applied.